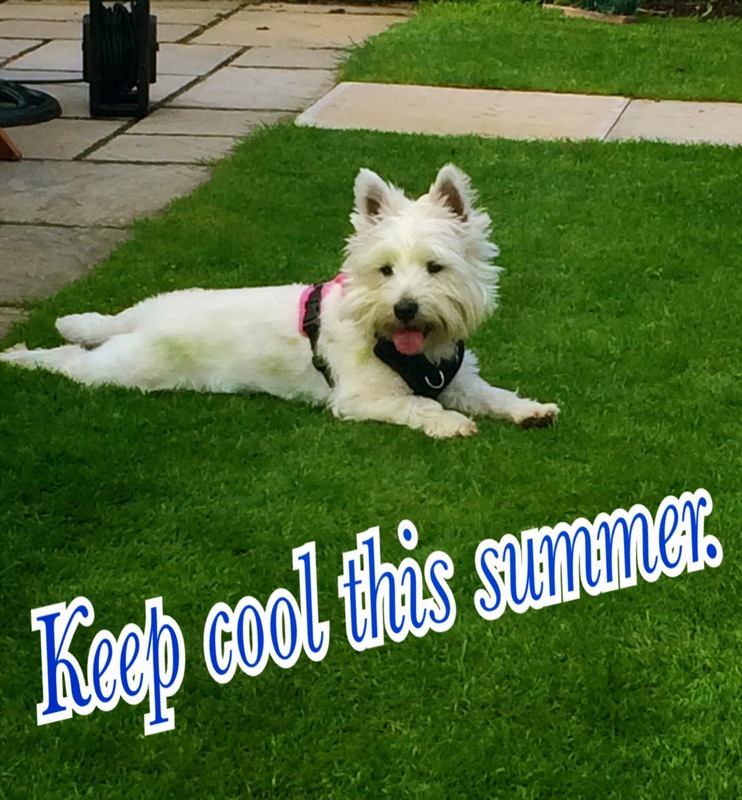 Summer Safety Series Part 1 | 7 tips to keep your dog cool this summer. I live in the UK and we are currently in the grip of a heatwave which could see temperatures reach up to 30 degree this weekend. You may think looking after dogs in summer is common sense but with so many dogs suffering unnecessarily it really does not harm to go back to basics. I know you are thinking, yeah obviously dogs need water. But it's really important to keep their water bowls topped in the summer with clean cool fresh drinking water. Especially as it's goes down quicker! During the really hot days we also like to add some ice cubes to keep it cooler for longer. I know there has been several suggestions of the possible harm ice cubes can bring to dogs. Personally, Lottie loves them and we feel they are just a myth. There is however always this handy Rosewood Cooling Bowl which needs no ice cubes what so ever. We also like to use our travel water bottle to take some with us on those summer evening walks. This is great for travelling and we don't leave the house without it. 2. A child's pool for your furry children. It's definitely summer in this household when Lottie's pool comes out. She loves it and it's a really cheap fun way to keep her cool. It's doesn't need to be anything fancy just a cheap children's one will do fine (Ours was under £5!) I am aware you can buy proper doggy pools but personally feel they are over rated and definitely over priced! Lottie loves the hose pipe. 3. 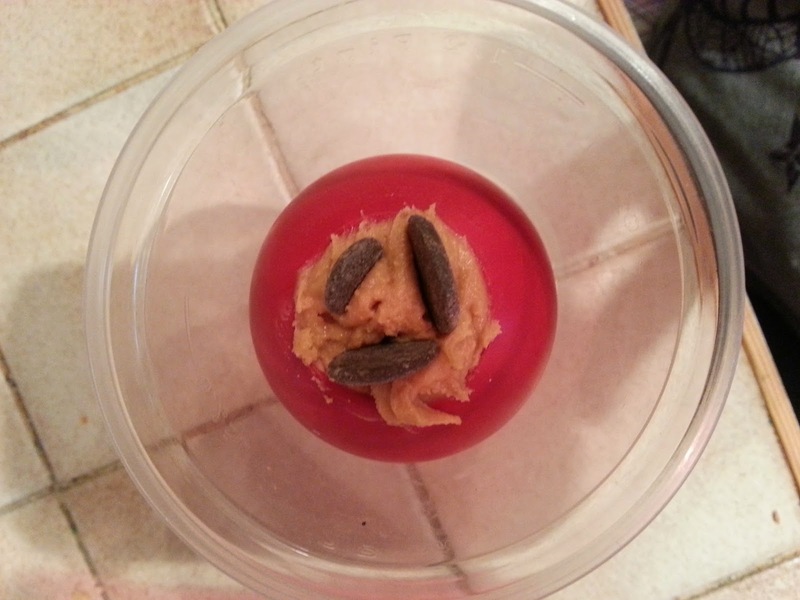 Make some yummy frozen doggy treats. If your dog is anything like Lottie they will love eating more than anything on earth! Until this summer we had not tried frozen treats, needless to say we are hooked. It's a great way to use your dogs love of food to your advantage by feeding them treats that are cool, high in water content or both. 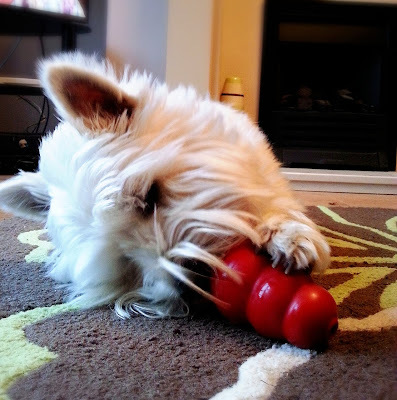 Lottie's favourites are a frozen Kong stuffed with lots of yummy treats, frozen Popsicles, peanut butter ice creams and an easy no need to prepare treat of frozen cucumber which has the added bonus of been full of water. 4. Provide a nice cool spot. Whether it's indoor or outdoors don't forget to provide your dog with somewhere nice and cool to lie. Lottie will often be seen sprawled across our kitchen floor tiles. We also leave the curtains and blinds shut in one room all day so it's keep it extra cool, we both then have the option of going and cooling off in there if the heat gets to much. If you don't have a cool flooring or your dog is outside soak a towel in cold water and let your dog lie on that instead. It's also handy for cooling your feet on too! Cooling her belly on the kitchen floor tiles. 5. Don't forget the shade. We have a lovely back garden but unfortunately not many shady spots. 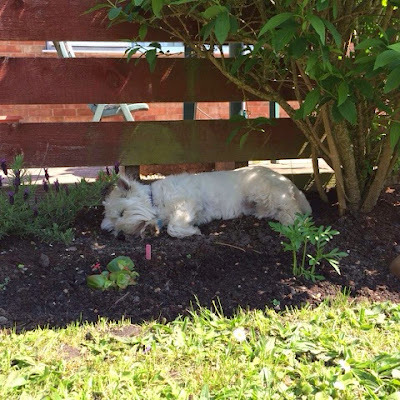 If your dog is outside don't forget to provide a shady spot so they can escape the hot rays! We like to set up a few umbrellas or a table which makes a shady spot underneath. There is also the option of a little pop up tent which could provide the ideal spot. Here's Lottie favourite shady spot! 6. Less hair is not always best. As tempting as it may be to have your really furry dog cut extremely short in summer, DONT!. Your dogs furs is actually providing a barrier which stops them getting sunburn and acts as an insulation against the heat. This does not means your dog won't benefit from a summer cut (Provided by a professional dog groomer) the undercoat is actually there natural cooling system, if left it can become matted and prevent air flow to your dogs skin. 7. Never leave your dog in the car! It's sad to have to keep repeating this, but time and time again people just don't seem to listen and more dogs end up suffering! Only last week a dog had to be saved from a hot car in our local are when the owner decided to leave the dog for the day whist at a theme park. Many people will response with I left the windows down. In fact leaving the windows down has very little affect on the overall temperate of the car. I always live by the motto of "if your dog can't get out at your destination don't take them'. It's much kinder to leave them at home than leave them in a red hot oven! These are just a few ideas to keep your furry friends cool this summer. Do you have any others you would like to share? Excellent tips! Love the recipe for the frozen treats. :) We have a similar bottle/bowl that we use when we go upland hunting. It is really handy. Great tips - so important to remind people of some of the dangers of summer heat to our pets. Great tips we use a lot of them ourselves. One treat my dogs really like is watermelon. Like the cucumber it is full of water and we keep it in the fridge so it's nice and cool. :-) Lottie sure looks like she enjoys that pool! We were definitely thinking alike in our posts!! You thought of some things I didn't...like keeping shades down to keep rooms cooler, we have a lot of windows in our house, and that really does help a lot. Also, your tip about grooming is great too. I once thought it would be OK to shave down a golden retriever (though we never did it), but now know better. Our golden gets just a nice summer trim now and I think that keeps her more comfortable.